When I think back a couple of years ago, I see myself being a student somewhere in the middle of Germany. Actually I studied in Goettingen, which originated up to 44 nobel prize winners and is very famous in international academia, but on the other hand it’s important for… like nothing. I was playing golf back then already but haven’t had a car to get a course. Instead I took one or two of my clubs, tied them to my rotten bike and was riding to a driving range that was owned and run by the university. That lead to the fact that there were no real facilities other than some driving mats and a small wooden house to pay the permission. You only ran into people that were in students’ age and were dressed like… yeah, students (i.e. baggy jeans, loose t-shirts, sneakers, caps… you get it). That was an interesting atmosphere and a very unique golf experience (at least for Germany). A couple kilometers north of Goettingen however, there is one of Germany’s best golf courses. Actually it’s a small golf resort, run by a local count, Count Hardenberg, and offers two championship courses and an additional 9-hole short course. Compared to the university’s golf range, this was quite different: everything was very expensive, there were affluent golf-tourists from all over Germany and unfortunately I never managed to play the famous Niedersachsen Course. What I did manage though was to play the 9-hole course couple of times and to get a ball, reminding me that at some point in time I’ll be back at my alma mater and will most probably play a proper round here as well. 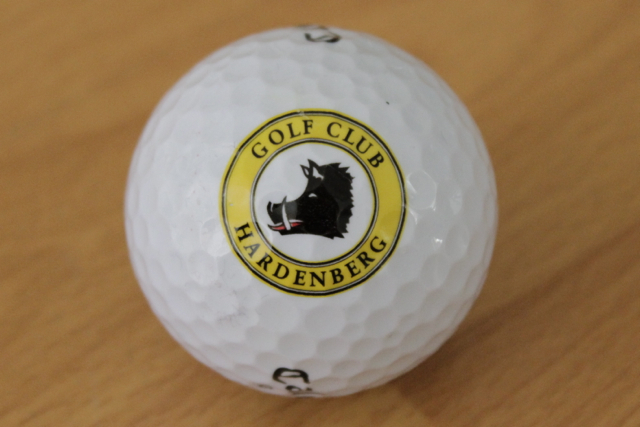 The Hardenberg Resort has one famous thing to offer that I’d like to mention here: the count’s logo and the logo of his main company (which is schnaps for the most part) is the head of a male boar. It’s really famous in that area and you’ll find that image on everything and everywhere. But what you probably don’t expect is an island green in the shape of that boar head. As I said, I never had the chance to play the course and probably this is just 50% amazing when you walk up there, but looking at this thing from above (like I always do with helicopters… #ehem) this is pretty awesome and unique I guess. Well, a boar head as an island green is unique enough, but I think 99% of the world’s island greens out there have a pretty lame and boring round-ish shape, as it is tough enough to get on the green then, you don’t need any more intimidating shape to scare off the golfer on the tee box. But I kinda like the effort they’ve brought into this and when you are fair; this really made the course famous – even county cross-border. Looking forward playing there one day.